In ten short years as an educator, I have taught every grade from sixth through twelfth, and every level of ability from AP to self-contained special ed. I say this not to impress you with how many different preps I have tackled in ten years, but to highlight this fact: I teach Shakespeare to every single one. Some groups read excerpts while others do whole plays, but I have an unwavering belief that anybody can learn Shakespeare with the right tools and framework. To illustrate this idea, let’s talk about crayons. 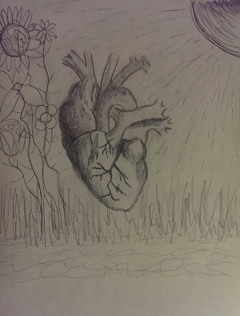 Present an eighteen-year-old with a box of crayons and you will see his eyes light up. “Is this a ‘Fun-Friday’ activity?” students ask, regardless of the actual day of the week. “Yes,” I say. I have no idea where ‘Fun-Friday’ comes from, but students say it as if it’s a title for something. I assume that this was a routine presented by a fuzzily but fondly remembered elementary school teacher. Suddenly my over-stressed seniors are distracted from their impending college applications and a buzz develops. Crayons. She brought crayons. Or markers. Or colored pencils. Or… whatever. As children, before we learn to write, we are given crayons as a tool to express our thoughts. Something about coloring throws us back to the simplicity and contentment of early childhood. Students get nervous that I will grade their artistic abilities, so I demonstrate for them my own lack of skill. Stick figures are encouraged. Laughter ensues; everyone relaxes. In this distracted globe. Remember thee? Last Thursday, October 15, my students and I were among the 225,000 people around the world who settled into cinema seats for a screening of National Theatre Live’s Hamlet starring Benedict Cumberbatch. 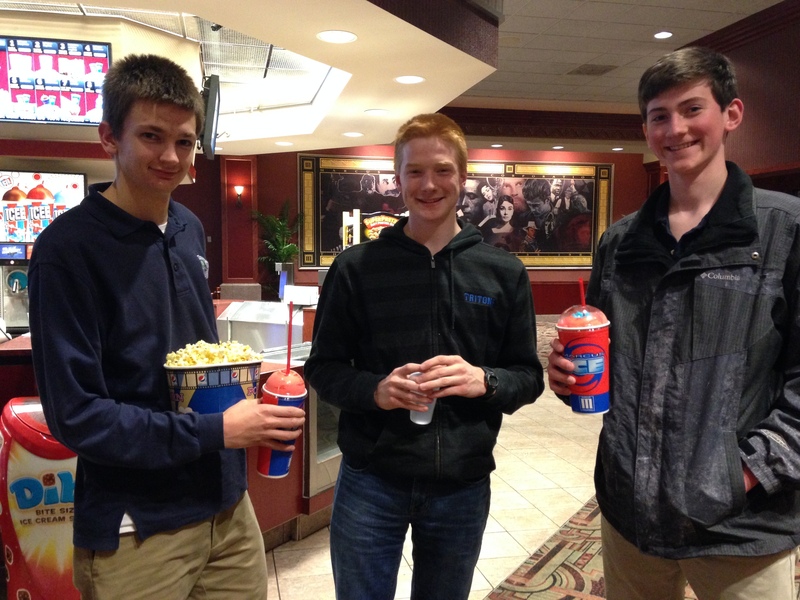 Getting my students to the production took some effort; our suburban theater wasn’t slated to show the play, but when I contacted theater managers and promised to bring a large enough group, they agreed to schedule a screening. I became a woman on a mission. This production of Hamlet is, as one Guardian reviewer notes, made for the cinema. The atmospheric musical cues delighted the student musicians in attendance. The stagecraft captivated students less familiar with Shakespeare’s language. And the performances left us all with much to discuss at intermission and in the classroom. One student, a wrestler and an actor, was still talking with his teacher about “Hamlet’s biceps” later in the week! He appreciated the physical endurance demanded by a role like the Prince of Denmark. For many who attended our optional field trip—students from all levels, all grades, and several different countries—this Hamlet was their first exposure to the character and the play. As they munched on popcorn or ordered a second ICEE from the concession stand during intermission, they peppered each other with questions: What was going on with Hamlet and Ophelia? Wasn’t Cumberbatch’s “mad Hamlet” funny? Had they been surprised by the on-stage explosion? Weren’t the soliloquies cool? Were Rosencrantz and Guildenstern supposed to look like hipsters? Perhaps the idea of mixing Twizzlers and “To be or not to be” makes some Bard fans cringe, but to them I say fie! 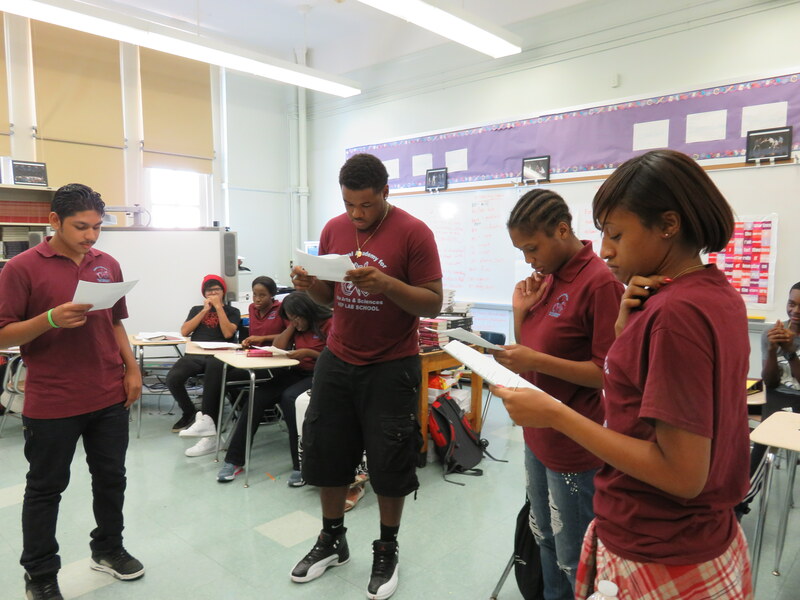 Students discussing Shakespeare without prompting might just be the first step to English teacher nirvana. Our “trip” to London and Hamlet was a joyous success, but it had its sobering moments, too. At the curtain call, the cast appealed to theatergoers around the globe to support Save the Children, an organization currently assisting refugees from Syria and other war-torn nations. Suddenly, the most memorable images of the production—a silt-covered Elsinore; childlike Ophelia’s careful footsteps over rubble toward her willow aslant a brook; the toy soldier uniform Hamlet dons in his “antic disposition”—held more weight. The “baser matter” of my busy day fell away as I was reminded that Hamlet’s Denmark is a war-weary nation. Shakespeare’s four-hundred-year-old play (and many others in his canon) offers a startlingly reminder of the human cost of war. Critics have mixed feelings about the spectacle of this new Hamlet as well as its famous lead, but there is something to be said for a production that can enthrall, inspire, and rally “distracted globes” across the globe. The success of this Hamlet speaks not only to the popularity of its leading actor but also the power of Shakespeare. For one night, National Theatre Live’s Hamlet invited the world (including three rival high schools from Green Bay) to contemplate the play’s sweeping human questions together. Meanwhile, the “Globe to Globe” tour of Hamlet connects countries one performance at a time. And very soon, another Hamlet will bind our often less-than-United States when Folger’s First Folio Tour begins in 2016. How ironic that the story of a house (and a hero) divided should have such power to unite. Stefanie Jochman teaches 9th grade and International Baccalaureate English classes at Notre Dame de la Baie Academy in Green Bay, WI. She received her BA in English and Secondary Education from St. Norbert College and her MA in English from the University of Wisconsin Oshkosh. Stefanie is a proud alumna of the 2014 Teaching Shakespeare Institute. Encore performances of NT Live’s Hamlet are showing at many theaters starting Oct. 22. Over the summer, the Rochester Community Players decided to try something we had never done before—put together a Shakespeare-specific summer youth program. Peter Scribner, president of the RCP’s Shakespeare Players, envisioned from the start a program that would have Rochester kids out doing Shakespeare, rather than passively reading the text. To implement this plan, he brought in a mixture of scholars and performers, with the result being a camp that reflects many of the Folger Library’s central philosophies. Our inaugural year was focused on the creation of a high-school internship program, to run concurrently with our long-standing free Shakespeare in the Highland Park Bowl series, which featured a double header this summer—1 and 2 Henry IV. As part of our new program, our interns were able to engage with theatrical and academic approaches to Shakespeare as well as technical stage practices. Our interns were with us from set-construction to closing night, including a two-week intensive where we met during the day to occupy the stage. Our focus from the beginning was making sure that the experience was meaningful and fun (Peter specifically did not want the interns to ever feel like they were sitting in a classroom). We designed every activity to encourage that feeling of “doing” rather than “receiving” Shakespeare. Whether we were engaging with the plays academically (table reading, scene comparisons, exploring a First Folio facsimile or analyzing monologues) or theatrically (diction activities, projection, stage combat, or costume design), our focus was always on enjoying the language. 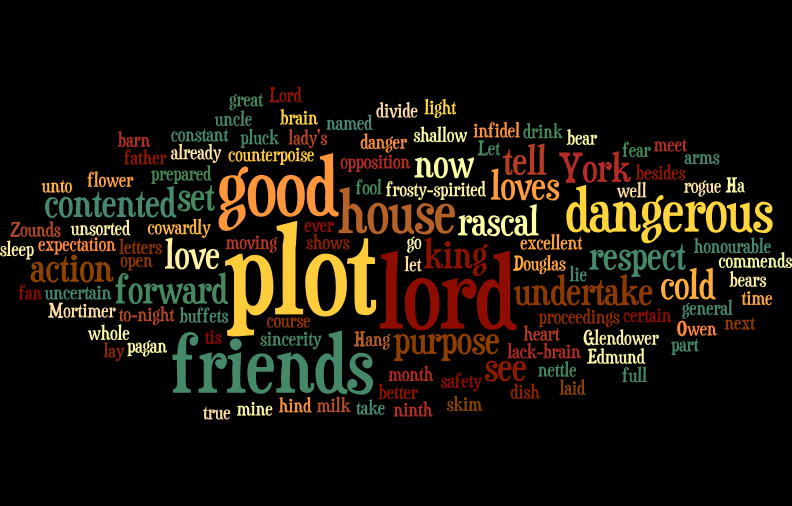 When we worked on staging a monologue, for example, the interns used word cloud versions of their self-selected monologues to help think about them in different ways. When they worked on diction, they attempted to recite their lines while holding corks in their mouths. 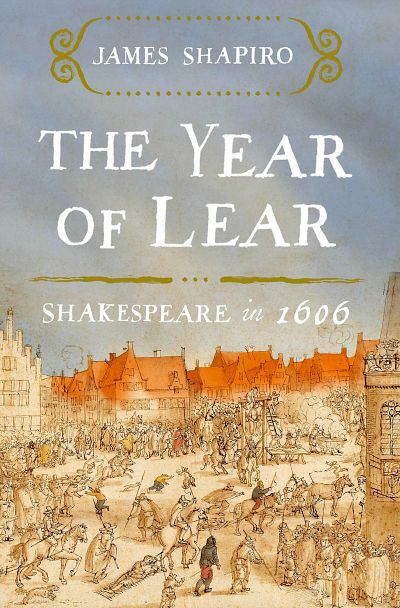 Last week, the Folger hosted a book launch for our colleague James Shapiro’s The Year of Lear: Shakespeare in 1606. Shapiro, Professor of English and Comparative Literature at Columbia University and member of the Folger Board of Governors, discussed how the tumultuous events in England in 1606 affected Shakespeare and shaped the three great tragedies he wrote that year—King Lear, Macbeth, and Antony and Cleopatra. He was also kind enough to stay with us for a Twitter Q&A at @FolgerLibrary. From the Publisher: The Year of Lear at Simon & Schuster. There’s a whole lot to consider and discuss—please share your thoughts with us at @FolgerEd! This summer I had the privilege of participating in the Folger Shakespeare Library’s Teaching Shakespeare Institute: Summer Academy. During this week-long intensive program, I was given multiple strategies for teaching Shakespeare’s Hamlet and other Shakespearean works. I learned that I should allow the students to perform scenes according to how they interpret the language. I should give them freedom to both direct and edit the scenes so that they will have more ownership in their individual performances. As a result of both the Academy’s suggestions and encouragement, I will no longer have a select group of students take individual parts and have the students read those parts while the other students in the class sit passively without paying attention to the text. Before the first day of class, I was determined to have my class use performance when reading literature, whether it’s Shakespeare, or any other author. Knowing that my incoming seniors would have had no prior experience with Shakespeare, I thought Romeo and Juliet would work well. I also decided that I wanted all of my children to study it. The class that I knew would possibly challenge me the most would be my Integrated Co-teaching (ICT) class. Some of these students have processing disorders, developmental delay, dyslexia, and other disabilities. As a result, I decided to implement language-based, performance-rich lessons while scaffolding the text for them to dispel any anxiety or discomfort while both studying and reading the text. Shakespeare in the classroom: What’s the teacher’s role? 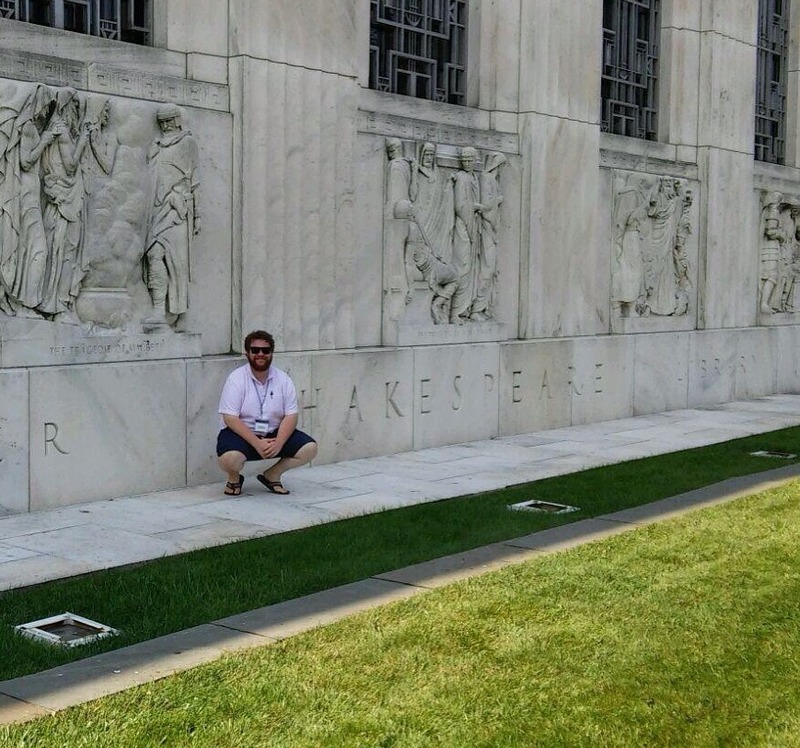 This past July, I had the great fortune of attending the Folger Shakespeare Library’s Summer Academy in Washington, D.C. There, I attended lectures given by master teachers and scholars; I played the part of the Ghost in a performance of Act One of Hamlet; I held—in these two hands—Walt Whitman’s copy of the Sonnets, a letter written and signed by Henry David Thoreau, and an authentic First Folio; though, mostly, I learned in a way that I had not, in years. I cannot honestly say that I have ever learned during the typical professional development opportunities that I have been offered. I have never been inspired by a webinar, nor have I been pushed towards daring, original thoughts during a mandatory workshop. I have been informed of products. I was told about strategies. However, teachers know what learning looks and feels like and it does not resemble the buying and selling of a gimmick. It requires a seemingly impossible level of concentration, desire, fear and motivation. It demands that a person grow comfortable with continuously dismantling an intricate and delicate level of understanding that had once been declared, “finished,” only to be rebuilt again, and again. Throughout my education I was taught to want to learn and that experience made me want to teach others to do the same. When I left Washington, I felt confident in my ability to do so, in a way that I had never known before. What had convinced me so thoroughly that the skills I was learning at the Folger could lead to authentic learning for my students, was that they emphasized student engagement with Shakespeare’s words—not a watered down alternative to his words; not theories that attempt to unravel his words; just his words. One of the lessons I appreciated most is titled “3-D Shakespeare.” It gets students right inside a scene, and puts that scene on its feet. I wish I could say that my 4th grade experience with Shakespeare set me on a course to love and study the Bard, but it did not. He quickly fell off my radar and didn’t appear back on it until my 9th grade year when we read Romeo and Juliet, and then again the next year when we read Julius Caesar. I think if it hadn’t been for Julius Caesar, I would have given him a chance, but the experience of reading that stupid play set me on a course to hate and avoid the Bard–we did worksheets and talked about caesuras and sat in our seats and read aloud. I vowed I would never again pick up a Shakespeare play, and was successful in keeping that vow. Until, that is, I needed to finish my English degree and the whole thing hinged on a single Shakespeare course. Do I really need to tell you about my anger when I realized I couldn’t graduate without taking a class about the one writer I hated more than anyone? Maybe it was my professor, or maybe it was the choice of texts she had us read or the way she led us through the conflicts and tensions and beauty of the plays, but that course changed everything. It was while sitting in our classroom on a spring day after reading Titus Andronicus that I realized I needed to be a teacher. Not because it was what all English majors would likely end up doing but because I needed to share Shakespeare. And the best way I could figure how to do that was by becoming a teacher.